When I went to a book signing for After You, Jojo Moyes said that she didn’t believe in sequels because, although characters are perceived to receive a happy ending, they always seem to “muck it” in the end. Although I enjoyed After You and believed it portrayed grief and mental health very well, it wasn’t as impactful, compared to Me Before You. So,it came as a surprise when Moyes announced another installment to the Louisa Clark story. It was not because I was hesitant, but I didn’t think there was more to tell of Lou’s story. I am glad to find that I was proven wrong. I absolutely adored this book. Now it may not be as emotional and witty as Me Before You, but I feel that is a great thing. Me Before You was a novel that stood on its own merit and Still Me is the same way. 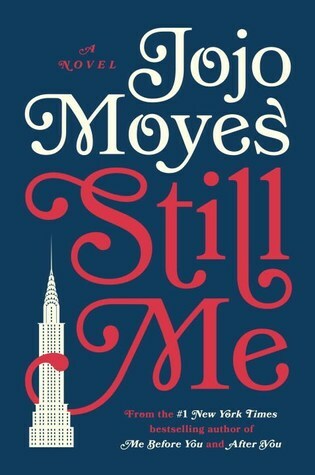 Still Me shows the progression of moving forward and taking risks and that is what all Moyes fans need to do with this latest novel: move forward but look back with fondest memories. We find Louisa, our lovable, quirky heroine, embarking on a new journey to NYC, working as an assistant to a rich and influential family. We watch her as she continuously tries to balance her work and personal life, at the same time struggling to find her place in this new environment. What I love about Moyes’s writing style is that she doesn’t make it easy for her characters. She gives the hard and gritty truth, a realistic portrayal that just jumps off the page. There are times you are going to question Louisa’s choices but that is the entire point. She is not perfect and just like the rest of us, she is struggling to find a place in the world, without losing an ounce of herself. This is way more than a romantic novel. Yes, romance is in it but unlike other women’s fiction, it is never the central point. And that is why I love Moyes’s books. The women are more about overcoming the obstacles than finding love. It is more an afterthought. However, I do like the progressing relationship between Louisa and Sam. It felt more modern than this unattainable relationship put on a pedestal. I felt emotionally touched by this book. For someone who is still trying to figure everything out in her life, I felt more connected with Louisa than in the previous books. I laughed, I got angry, I nodded along, and I cried. This book had everything. You could really feel the turmoil and the heartache that Louisa was going through. In this last installment, it was Moyes returning to her true form. So make sure to pick up a copy of Still Me when it is released next year, January 23, 2018. It is safe to say that this will be the most talked about book of 2018. If you are a fan of both Jojo Moyes and Me Before You, you will definitely not be disappointed. You may not like sequels but this one is the exception. Take a chance. I received this advance reader’s copy from NetGalley for an honest review.